Click Details in the School section. The Details screen displays. Login authentication is performed after the first faculty file is uploaded to FACULTY180 and is managed by IT resources from Interfolio and your institution. We support direct login and several single sign-on authentication systems. Contact your Interfolio Project Manager if your institution would like to consider other login options or would like documentation for implementing login authentication. (The Unit Designations functionality is only available to FACULTY180 administrators at your institution. Users must set up the hierarchical structure of their institution in F180 by adding units by level, from highest to lowest. For example, a university may be the top level, with colleges beneath the university that in turn contain schools, and schools that contain departments, and departments that contain disciplines, and so on. Configurations at the highest level (level 1) will flow down to all levels below. 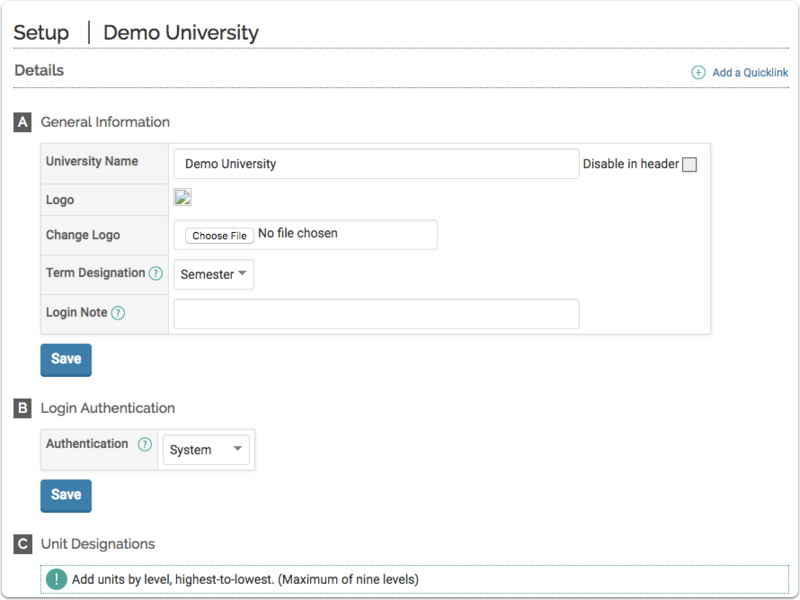 For reference, see the unit designation that has been created in your demo database (Demo University). In Demo University, Level 1 = University, Level 2 = College, Level 3 = Department, Level 4 = Discipline. We currently support an organizational hierarchy that is 9 levels deep including a base level that is reserved for Faculty within our system. This means you can add a maximum of 8 levels to the list of unit designations for a total of 9 levels. Clients can add faculty ranks or provide a list to Interfolio to be added to FACULTY180. This list can be expanded based on the needs of your institution (e.g. professor, associate professor, etc). This list of faculty ranks must match the rank field in the faculty file. See Upload Base Data for more information. This is a critical item intended to be set up once and not be changed. The Academic Terms functionality is only available to FACULTY180 administrators at your institution. Faculty Input Form Title: Your institution can change the name of the Activity Input Form in this screen.The Activity Input Form is used by faculty members to manage their activities that tend to change each academic term, such as teaching, scholarly and creative contributions, and service. This form is used during formal input periods, in which all faculty members participate. Default Faculty Status Filter: Specify the default faculty employment status (e.g. full time or part time) when selecting faculty. Uncontrolled: Faculty enters committee name in an open text box. Years in Drop-downs: Select the number of prior years (up to 100) in all drop-downs that contain the year field. FACULTY180 Administrator Name/Email: Specify an administrators name and e-mail address to be included in outgoing email messages. This is the individual who users will be referred to for primary support and questions. We recommend that a generic name and email address be created for this purpose, such as support@institutionname.edu. Send System Emails Using FACULTY180 Administrator Name/Email: Specify if e-mail messages sent from FACULTY180 via the Communication screen should be sent from the FACULTY180 administrator's account, based on the unit level. Otherwise, all e-mail messages sent via the Communication screen will be sent from the account of the FACULTY180 user who is creating the message on the Communication screen.The default text in the From field is FACULTY180. Time Zone: Select the most appropriate time zone for your institution. This selection will affect the start and due dates for faculty performance evaluations (such as annual reviews, promotion and tenure evaluations). Course Attachment Reminder: Click Yes if your institution wants a pop-up box to display a reminder message to faculty members to upload course attachments before submitting the Activity Input Form as part of the formal input process. Note, by default attachments are not required. Allow Emails To Be Sent: Select to allow or not allow e-mail notifications to be sent to faculty members. Note: We recommend turning this feature off during implementation so messages are not sent to faculty from the system. Autoload Reports: Specify if reports should be automatically loaded each time a report is generated. 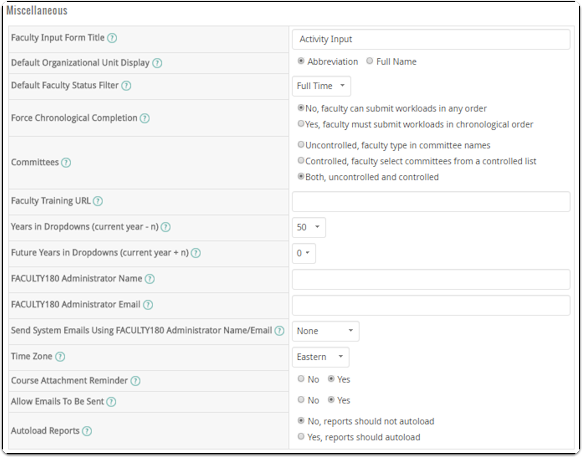 If reports are not automatically loaded, then various report filters display, allowing administrators to select the type of report data to view. This is helpful if a report contains a large amount of data, causing the report to load slowly. Administrators can create custom announcements for their institution. Announcements display in the Announcements and Help page. Examples of announcements are upcoming events and deadlines and links to training documents. In the Announcements section, make sure the Show option button is selected. Use the Hide option to hide existing announcements that are no longer applicable.